Among the various civil infrastructure maintenance requirements, repair and replacement of bridge components can be one of the trickiest and most essential to public safety. Multiple bridge damages and failures have made the news in the past decade. It is clear that much work needs to be done to assess bridge safety and make repairs, and different techniques should be used depending on the circumstances. Bridge jacking is also known as structural lifting operations. The structural components or members of the bridge are incrementally lifted or propped, and each member is individually repaired or replaced. This sort of lifting operation is necessary to ensure the structural integrity of the bridge as repairs are completed. Bridge shoring does not actually move the bridge or its members. Shoring adds temporary support to the bridge structure. Bridges can support a live load when shored but not while jacked. Both jacking and shoring may be necessary in a variety of situations, including repair or replacement of bridge members such as girders, beams, and piers. These operations may also be part of a larger bridge construction or rehabilitation project undertaken by a professional engineering firm. These firms work on such projects in conjunction with construction contractors, like ourselves at Payne, along with the state Department of Transportation in the case of public bridges. Why is bridge jacking important? Bridge jacking is necessary to relieve the load of the entire bridge structure so that repairs to existing components will be fully effective. Hydraulic systems are typically used for stressing cables, replacing trusses and replacing bearings and beams. Jacking is also used when a bridge is being completely replaced. The old failing structure is removed, and the newly constructed bridge is lifted into place. Rigging may also be necessary, particularly during the inspection process. Bridge jacking and bridge shoring are both essential techniques used by professional engineers for achieving effective civil infrastructure repairs and replacements. 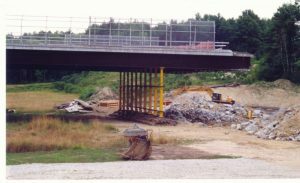 Ensuring that all bridges, both public and private, are safe to traverse is extremely important and at Payne Construction Services, we’re here to help! For more information about our bridge jacking, shoring and rigging services give us a call or click here for a free quote.